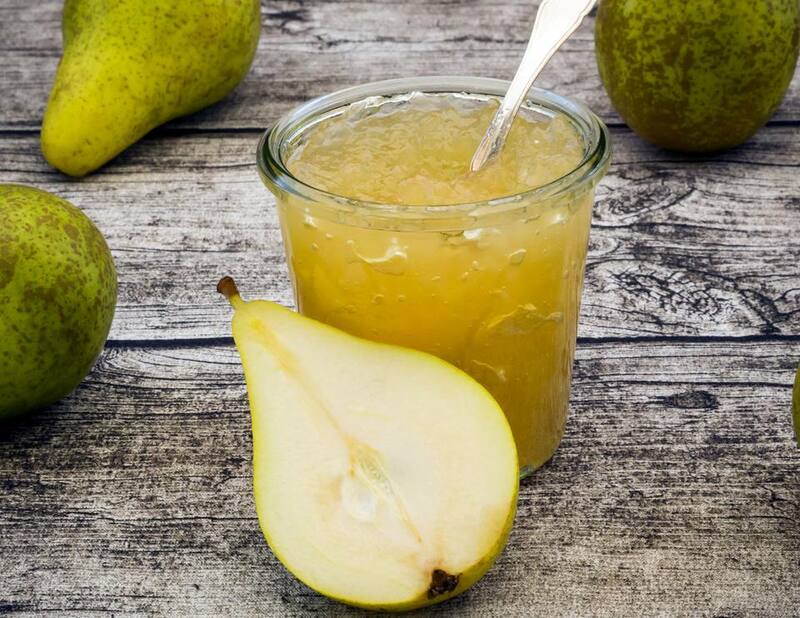 Pears are abundant in Eastern Europe and they often find their way into pear butter. This recipe is simple to make and requires only three ingredients—pears, water, and sugar. It can easily be increased. You have your choice for how you cook the pear puree. You can use a slow cooker, microwave, stovetop, or oven. If you are going to enjoy your pear butter within a couple of weeks, you will only need to refrigerate it after you've cooked down the puree. You can also freeze the pear butter for use for up to a year. However, if you want to preserve your pear butter for use in coming months you will need to put it in sterilized jars and process them in a water bath. Before attempting a home canning project, be sure you have all of the needed supplies and understand how to use them. Your canned pear butter can make a lovely gift. Place the pears and water in a saucepan and bring to a boil. Reduce heat and simmer until pears have broken down. Pass the pears through a sieve or food mill. Combine the pear puree and sugar to taste and choose one of the following cooking methods. In each case, the puree will be thick enough when the butter doesn't run off a spoon when turned upside down. Slow Cooker: Place sweetened pulp in a slow cooker with the lid partially off to let steam escape. Set at low and cook, stirring occasionally, for six to 12 hours or overnight until thick enough. Microwave: Place the sweetened pulp in a microwave-safe bowl and cook for 20 minutes at a time, stirring frequently until thick enough. Stovetop: Place the sweetened pulp in a medium saucepan and cook over medium-low heat, stirring frequently, for one to two hours or until thick enough. Oven: Heat oven to 250 F. Place the sweetened pulp in a heatproof casserole dish or roaster. Bake, stirring only occasionally, for one to three hours or until thick enough. When the pear butter is thick enough, you have the choice to refrigerate it, freeze it, or can it. If you don't choose to can it, the butter can be kept refrigerated for up to three weeks or frozen for up to one year. You can freeze the pear butter in freezer-safe containers. Be sure to label them with the contents and the date. To can your pear butter, place the hot butter in hot sterilized jars, leaving 1/4 inch of headspace. Cover with hot sterilized lids and rings. Process in a water bath for 10 minutes. Remove the jars to a counter and allow them to cool before storing them in a cool, dry, dark place.